Pre-order the newest Droid family member today at Best Buy or Best Buy Mobile! Time to go wait in line for the Droid X, people. As they’ve done previously with the Incredible, BB scooped an early pre-order spot almost 3 weeks before launch which also allows you to avoid that ridiculous $100 mail-in rebate card that Verizon will rarely wave. 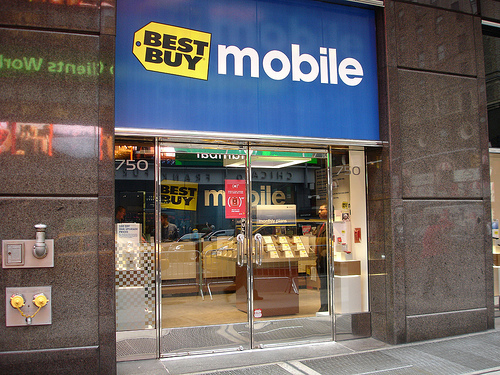 Best Buy and Best Buy Mobile have truly become the leading destination this summer for all your mobile smartphone needs – from HTC EVO 4G from Sprint to the iPhone 4 on AT&T to the upcoming DROID X on Verizon. Enthusiasts of the Android platform can be the first to reserve a copy of the new Verizon DROID X by Motorola today at Best Buy. The pre-sale begins June 25 and the smartphone will land in stores on July 15. The Verizon DROID X by Motorola features Google’s Android 2.1 operating system, 4.3-inch screen and 720P HD video recording and playback. Android 2.2 will arrive to customers on the DROID X later this summer. The DROID X is available at Best Buy for $199.99 with 2-year activation, with no mail-in rebate hassle. Anyone on their way right now?